Visual Studio Code>Programming Languages>ca65 Macro Assembler Language Support (6502/65816)New to Visual Studio Code? Get it now. 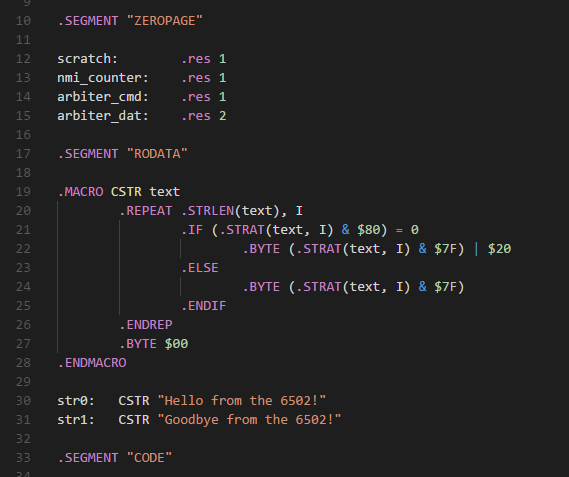 Provides language support for the ca65 macro assembler. This extension provides syntax highlighting and problem matchers for use with the ca65 6502/65816 Macro Assembler. All 6502, 65816, and variant opcodes are supported by the syntax highlighter, as well as all ca65 pseudovariables, control commands, operators, and literals. This extension automatically registers build tasks for 6502 and 65816 assembly files which invoke cl65 on the file currently being edited. If you have one or more memory map configuration files in your workspace folder with the .cfg extension, a task will be created for each of them in addition to the default task, which does not specify a configuration file. You can also create a file in the root of your workspace called cl65config.json. This allows you to optionally specify the name of the input file which is passed to the assembler as well as any additional parameters. You can use these problem matchers in task.json using the normal syntax. Added autodetected build tasks. Added support for cl65config.json.